We’re getting close to the end. 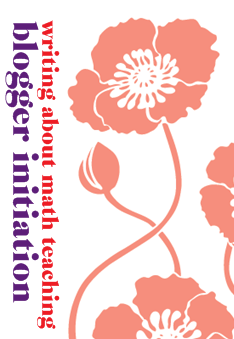 This is week three of the Math Blogging Initiation. And although most of us featuring the new bloggers have 7 or 8 people to showcase, this week I only have 5. I anticipated a few extra late bloggers, but they didn’t show up! Overall, this week we had a little less than 90 bloggers! You guys are like the little engines that could, especially considering that by now, everyone has started school. This is possibly the most stressful time to do something like this, but you guys are killing it! I’m so impressed with all y’all. My Reaction: I love this post precisely because Haydee’s trajetory to becoming a teacher was so different than mine. Not that we both didn’t have excellent teachers, but she wasn’t a math-lover at first. And so to read the story of someone who had such drive in a different direction at an early age, and who was so affected by one particular teacher who put her on the path to becoming a teacher… well, it was a pleasure to read about. My Reaction: Tim notices, as I’m sure we all have, that our kids learn mechanical rules without any understanding of why they work. His solution: just have students plug in numbers to see that it doesn’t work. Personally, I think that’s a great way to start working on these misconceptions. To take this further, this post has gotten me wondering… I wonder if there isn’t a way to dig deeper, to remediate the misconception instead of just showing that their mechanical process doesn’t work. Digging into why they think it works, why it doesn’t work, and finding a way to make that stick with them? It’s well and good to say “look this doesn’t work” but harder to say “this is why” and also “this is what does work, and this is why.” I think some sort of brain laser will do the trick. Tim, you on this brain laser? My Reaction: A cogent, thoughtful, and convincing critique (not tear-down, though) of Lockhart’s Lament. I was inspired by this document when I first read it a number of years ago (and although he teaches literally next door to my school, I have never met him). However, the author reminds me of something that I’ve noticed in my classes. I am someone who tends to eschew the “applied” nature of math and instead focuses more on the organization and elegance and puzzle-y nature of things. Because that’s what appeals to me. But many of my kids, so many of them, really respond to the applied stuff… even if I see it as loosely applied or even fake-ly applied. Like our “can optimization” project in calculus… Many kids really dug that project, even though it felt pretty forced/fake to me. They see it as real. And so I have to remember to not always eschew the applied, because just because it didn’t speak to me when I was a student doesn’t mean it won’t speak to any student. I’ve sen the contrary. My Reaction: First off, I love the picture. Makes me long for summer vacation again. But seriously, I think that David has a plan of action for Algebra II. He’s teased out what the “core ideas” are for the course, for him, and these are the ideas he wants students to take away. Instead of being topics, they are actions… ways of dealing with problems. And I love that. The process is fundamental, and the result is incidental. This almost makes me feel sad I’m not teaching Algebra II this year! My Reaction: My honest initial reaction was “surprise!” because Valerie spoke about how she saw teaching kids math as a religious calling… and I’m not religious and nor are most of my teacher friends, so this wasn’t a response I had ever heard. But Valerie, because of seeing teaching as her calling, said something that moved me. She has the desire to see and cultivate her kids’s best selves. That’s a really lovely thought. I do hope that Valerie uses religion to shape her beliefs, but not part of the classroom, unless she teaches at a parochial school.